It is likely that this chintz quilt dated in the last years of the Civil War, while finished or quilted then, was begun in the 1840s or '50s when English chintzes were abundant in peacetime Charleston. The wartime Cotton Famine in the U.S. resulted in increased prices for a yard of calico, the once-inexpensive mainstay of the American wardrobe and the American quilt. Yates Center, Orleans County, New York. Collection of Janet Garrod Chinault. 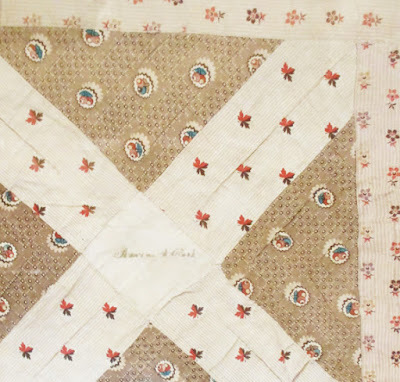 In my first book on quilts and the Civil War I wrote about prices in the Confederacy where banknotes were so inflated that "$200 was required to buy a calico dress" (about ten yards). 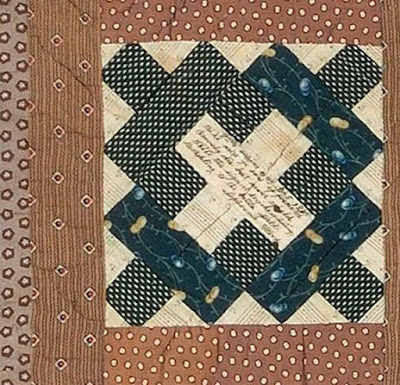 Cornelia Peake McDonald recorded twenty dollars a yard for calico that had a pre-War price of twenty cents. 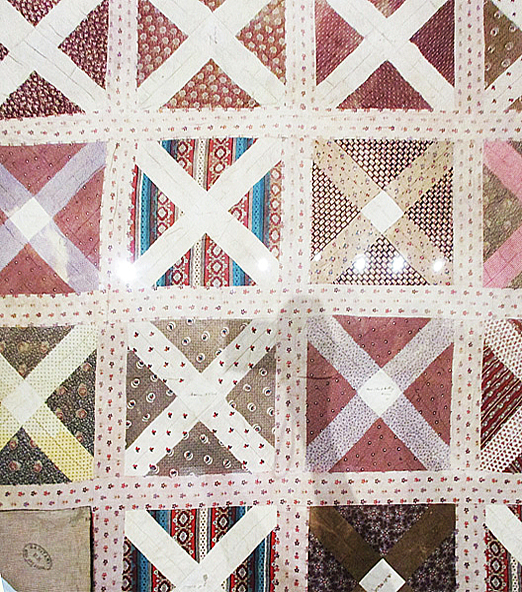 $20 a yard seems to be the high price recorded at the time, but in memoirs written after the war the price went higher. Virginia Clay-Clopton remembered "Calico of the commonest in those days was sold at twenty-five dollars a yard." 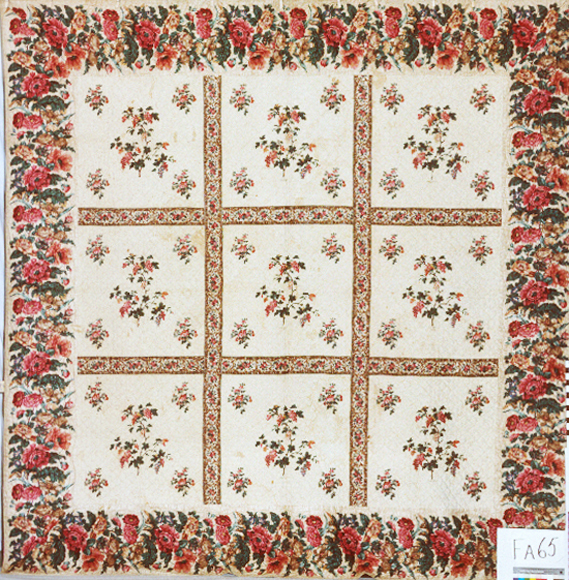 I haven't found much in a higher price per yard since that research. found it profitable to advertise as far away as Raleigh, North Carolina. 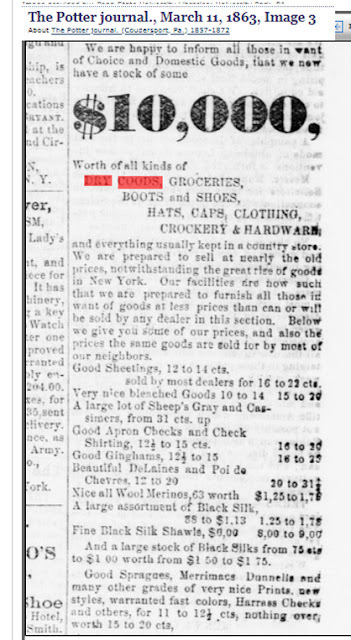 Looking through wartime North Carolina newspapers at the Library of Congress's Chronicling America website one finds a change in advertisements for "dry goods." 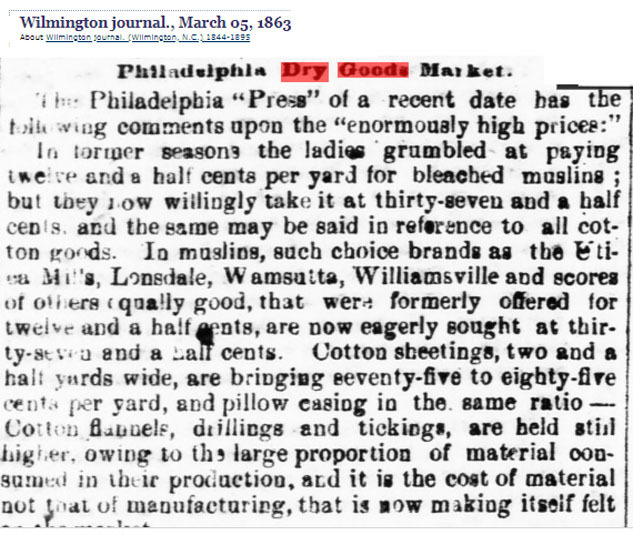 1861 ads enticed customers with descriptions but by 1862 the term dry goods was enough. And most of the ads after 1862 were for wholesale goods. Retail shops did not have to advertise if they had any dress goods for sale. Word of mouth was probably enough to create a market. 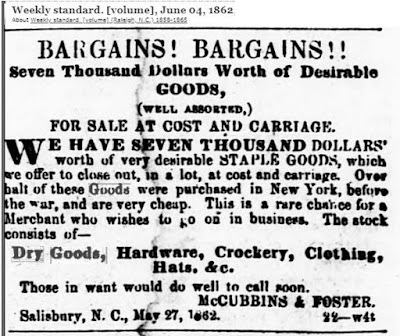 North Carolina ads like the one above offer "desirable goods...very cheap" to those interested in setting up a retail business. 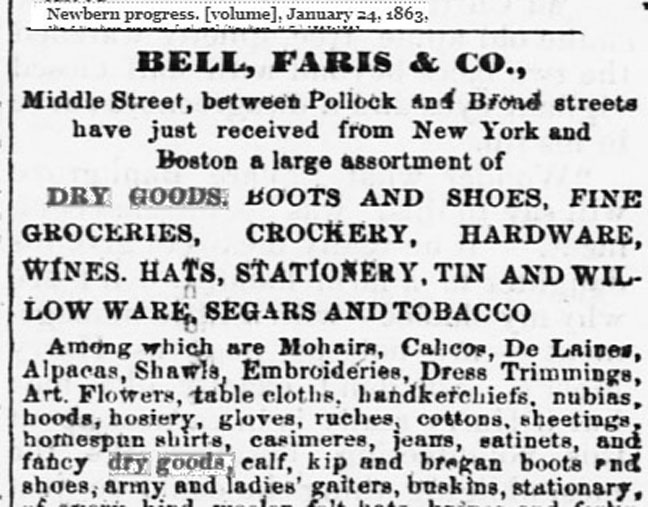 In June, 1862, McCubbins & Foster still had access to New York merchandise shipped south before the war. 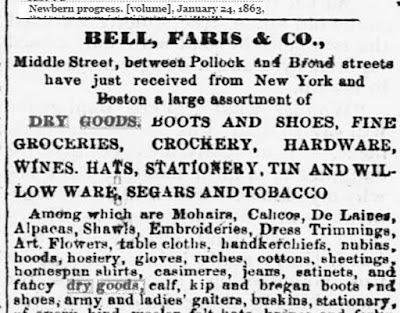 In January, 1863 Bell, Faris & Co., retailers in New Bern, advertised dress goods (mohairs, calicos, delaines, alpacas and trim) "just received from New York and Boston." We can assume these were goods that ran through the Union blockade. Wilmington, North Carolina was the center of blockade running. This 1863 ad is for a single-day wholesale auction of goods direct from England, brought in on steamships Douro and Eagle. 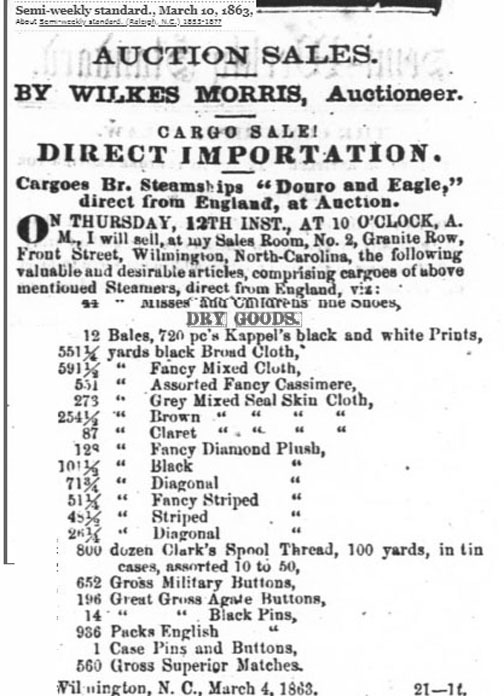 Items included "Kappel's black and white Prints" (perhaps a cotton print), Clark's thread and pins. Connecticut friends for the Union cause. 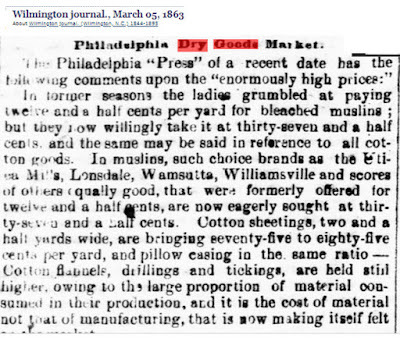 In 1863 Potter County, Pennsylvania a retailer sold fabric "at nearly the old prices, notwithstanding the great rise of goods in New York." 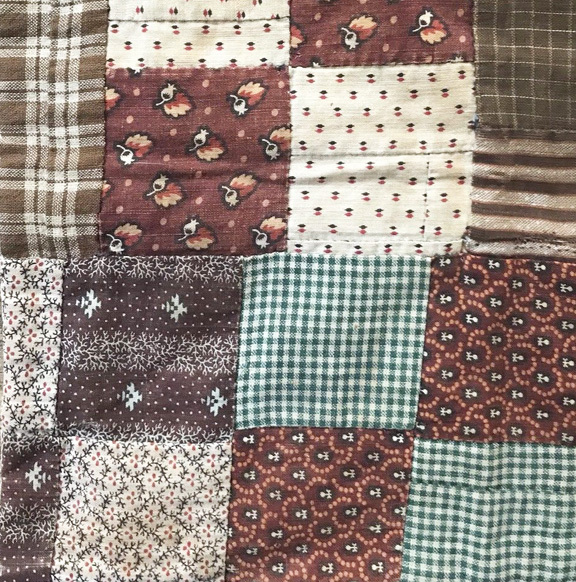 They still sold apron checks at 16 to 20 cents and "Good Spragues, Merrimacs, Dunnelle...very nice Prints...for 11 to 12-1/2 cts, nothing over, worth 15-20 cts." North Carolina women might only sigh and wish they could find cottons at that price. Fascinated to find Wamsutta among the fabric listings. "Dry goods" is a phrase that always intrigued me. Did it evolve from a time period in contrast to a category called "Wet Goods" or does it have some other etiology? Barb---I've always wondered myself and I happened to have read the answer in a book about 18th c trade in Philadelphia just last week. 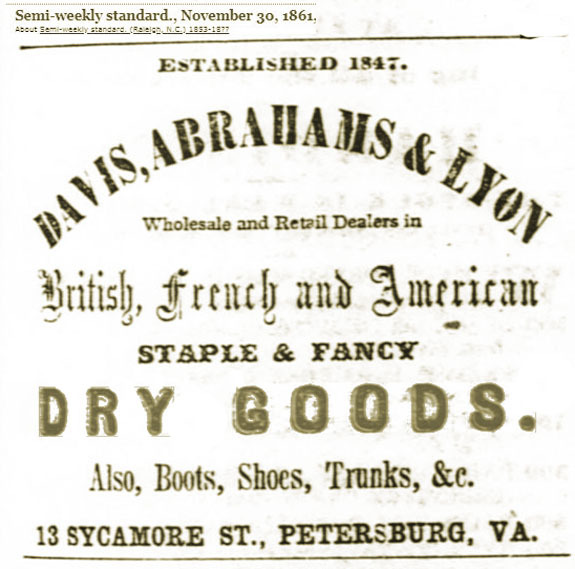 Dry goods were manufactured goods, including textiles. The other category was provisions or groceries so a shopkeeper might specialize in provisions or dry goods. I assume those who sold both would have a general store. Worth a post. I'll read some more. I guess I won’t complain about $12 yard fabric, but prices have been steadily rising in the last 30 years that I have been sewing. I’m not sure how high it will go but being on SS I have to pick and choose. 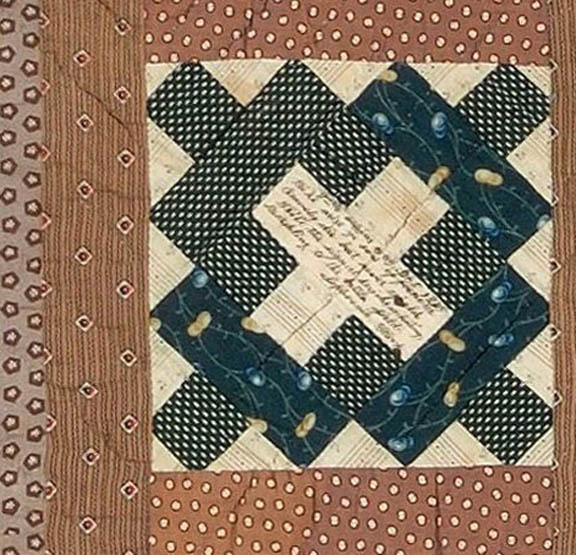 1861 Quilt for Carrie F. Foster: "Life's Sorrows"